I know the sound of two hand clapping. What is the sound of one hand clapping? Mr. YooWho decided yesterday to do his best to answer one of the more famous of Zen koans. 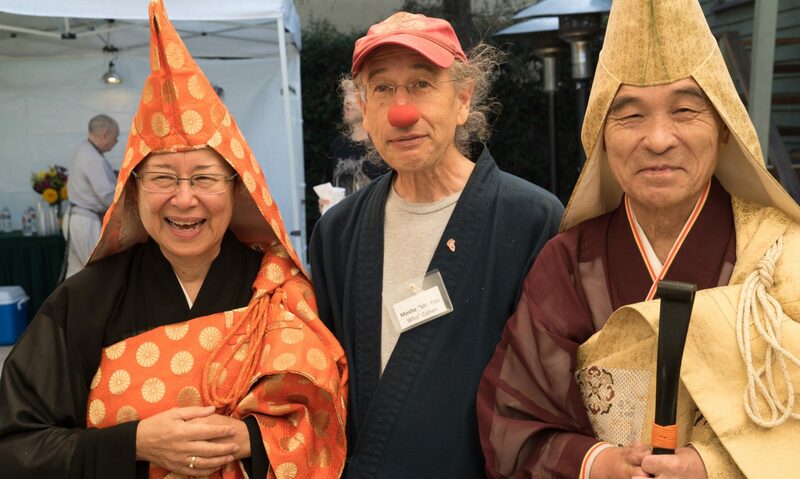 It might seem a complete paradox to offer up for consideration that there are strong parallels between the world of clown and Zen. One first might have to be a little more specific by narrowing it down to the world of European or Contemporary Clown, one who engages in performance in complicity with the audience. 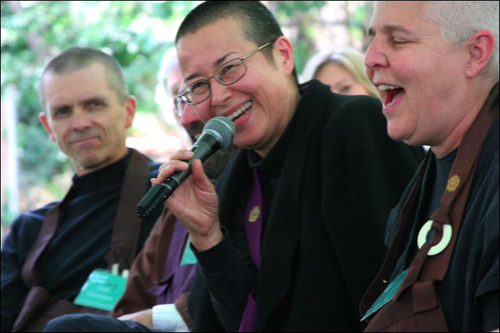 It might seem like a paradox to search for similarities as Zen Buddhism is such a serious endeavor and clowning, well isn’t that about joy and laughter. 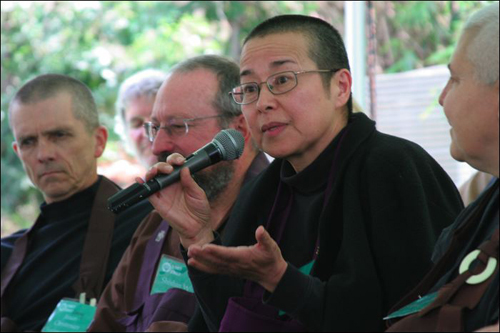 The first clue that leads beyond the paradox is the sheer good natured ness of many Zen practitioners. The second clue might be how serious many clowns can be when they are off stage. The true nature of the similarities however lies more in the practice than in the practitioners. Listening. Attention, concentration. One major parallel between clown and Zen is the practice of listening and hence focus and concentration. In the world of Zen meditation, the practice involves placing ones attention on breath, on listening to one’s breath, and whenever thoughts arise, letting those pass so that one can bring one’s attention back to listening to one’s breath. 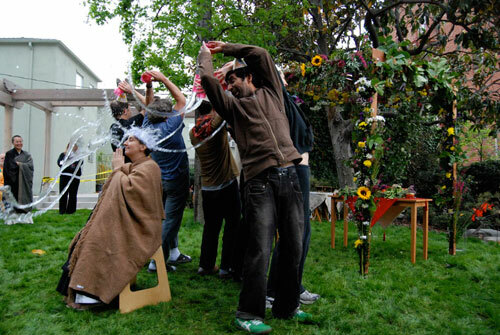 In clown, one’s attention is also placed on listening, in this case to one’s performative energy and to the audience’s response to it, listening to how the audience is reacting to one’s actions, or inactions. If there is more than one person on stage, one is also listening to what one’s partners on stage are doing, or not doing, and how the audience is reacting to that. In the moment. In Zen, and Buddhism in general, there is a strong emphasis on being in the moment, in other words not thinking about the future or the past but to live what is happening in the moment. Clowning has a similar emphasis the focus is to play what is happening in the moment. Whether it be something being generated by the clown or by the audience, the focus and potential humor is what is happening for everyone, audience and clown (s). Light-Enlightenment . On a more esoteric level one might consider the goals of the two practices. 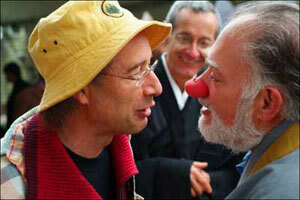 The Clown seeks to bring lightness into the hearts and spirits of their audience. This is most often interpreted as laughter, however poetry, charm, beauty are also a form of light that the clown seeks to share with their audience. In their most powerful moments, the clown brings light into the darker emotions such as anger and sadness. One goal in the practice of Zen is reaching enlightenment, which perhaps could be interpreted as being full of light? En-lighten, to bring in the light. Could one be so bold as to suggest that these are similar paths? Of course there are many differences in the practices, perhaps the most obvious being that where the meditator will let what arises dissipate, the clown may well seize that as an opportunity for action. 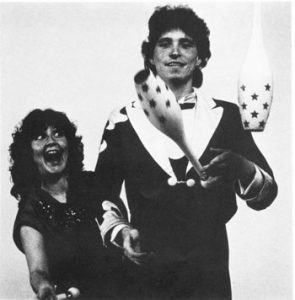 Marc Jondall and Judy Finelli, from Juggler’s World, 1987. My upstairs neighbor, Marc Jondall, former performer with the Pickle Family Circus, gave me these comments as we quipped about clown and zen. We were in the midst of cleaning off construction dust on big sheets of plastic as the artist’s collective we live in, Developing Environments, is undergoing building code upgrades. What’s the sound of one clown laughing? To the clown, the present is to be present. Moshe: you expand and amplify it. Egyoku: Exactly. It is a wonderful thing. That is right in line with meditation, because that is what happens when a person meditates in a way. M: You amplify and expand? E: Yeah they do, actually they do without realizing it. Life becomes the moment. It is an exquisite thing. And then you connect with that.. That is what you do, you take this little moment. And it grows like that, and that ties right in with Zen because that is the experience of meditation, that is actually what happens: being able to rest in this moment, and to be able to taste it and appreciate it. To just be there with the moment, and that is what the clown does, you have to really be there. You are staying connected and at the same time you are communicating. E: The other thing I think is interesting, we have this expression, we talk about it with anger but I think that it applies here too: I roll all negative experience into my practice, and we can also say: I roll all positive experience into my practice. M: So in meditation you call up this anger? E: You don’t call it up, you just sit with it. You just take it as part of the whole as opposed to ‘this is not supposed to be there.’ This is what I think the clown is doing, I see this, everything is just taken in, it becomes a clown moment. There is nothing that is not supposed to be there. M: Right anything can be clowned. M: So would you call these parallels to Zen. E: I would call these parallels to a meditator’s experience. Zen is really about meditation, it is about sitting, we don’t call it meditation, we call it zazen, or just sitting. Vipassana also has this sitting. Some of the Buddhist practices don’t have a lot of sitting. I think it is this quiet meditative experience that allows us to touch the deepest places of life, of one’s self in life, because that is what you got to do. M: There are many levels that you can touch, the clowning can also remain relatively superficial. E: It is the same with sitting. M: Sometimes they stay in their mind thoughts. As a teacher, can you tell that? E: yes. One of the ways it comes up is what people bring up to share. You can see that this is so STRONG, they haven’t yet got that we are going to leave all that aside. E: Sometimes it is years. Sometimes it is just different levels of it. It is hard to let go of what is going on up here ( gesture to the head) because that has been real for us. That is what is real! (Laughter). Bernie is known as a pioneer in the American Zen movement. 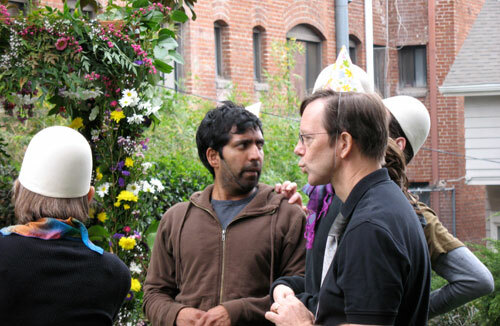 One element he has brought to the Zen world is the practice of street retreats and the Retreat at Auschwitz Birkenau. His approach on how to take on these retreats are to follow these Tenets. Not Knowing-Open space of not knowing. Loving action, healing action. 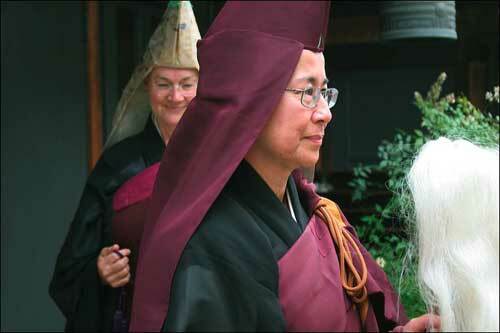 Roshi Egyoku commented that this is really is a Unifying Action-Action that serves the whole. The practice of Not Knowing involves letting go of all preconceptions and knowledge, so as to bring full awareness to the situation at hand. As preparation for the 5 day retreat at Auschwitz/Birkenau, one is required to prepare by watching films, and reading books about what took place during the holocaust. Once in the retreat, however, one is asked to let all that knowledge fade out, and the focus is on awareness in the present moment; what feelings sitting in this place calls up. The witnessing triggers the recall of some of the knowledge one has accumulated, at the appropriate times. These three tenets are derived from the 3 pure precepts of Buddhism but the language was such that we thought that needed to be recast. Do Good-Deeply Listening to what is going on . Do Good for others. What is the action that serves the whole. A Clown performance is very much a constant practice of the three tenets. The performer is usually at his or her best when they are completely present on stage playing the moment, in other words they are not thinking about what they are doing next, or what comes next. One can say that this thinking would take them out of the place of Not Knowing/Bearing Witness but even more important, the audience can feel this slight absence of the performer’s presence. Another aspect for a clown performer, and one of the greatest delights, is when an unexpected situation occurs, and everyone in the room is aware of it. The focus on what will happen next is usually palpable in the room. If the performer operates from instinct and intuition, the situation becomes an opportunity for great humor to be shared in the room. Bearing Witness: The Clown operates from a place of not knowing, and bears witness to the situation at hand. Loving Action: Operating from instinct, wishing to uplift the audience, the clown’s resulting actions are most often unifying actions ,as the humor involved is both a loving action, and the laughter it generates serves the whole unifying the audience through laughter. A good example is a story from Cirque Du Soleil’s Kooza performance last weekend (as told to me by my friend Maica). In the show there is a wonderful pickpocket number. The Magician goes into the audience looking for a volunteer to bring up on stage. That evening, the performer chose a man who really was uncomfortable. Once on stage, as the performer was addressing the audience, the man eyeing a back staircase escapes the stage and starts to make his way back to the seat, a spotlight following him through the audience. The performer caught by the situation spontaneously launches into a spiel about how that volunteer wasn’t quite right and he is going to find a better one. The evening before, the show I saw, the volunteer stayed on stage and participated in the act. The volunteer taking off, according to Maica, was very funny, as the Pickpocket worked the situation for maximum comic effect. 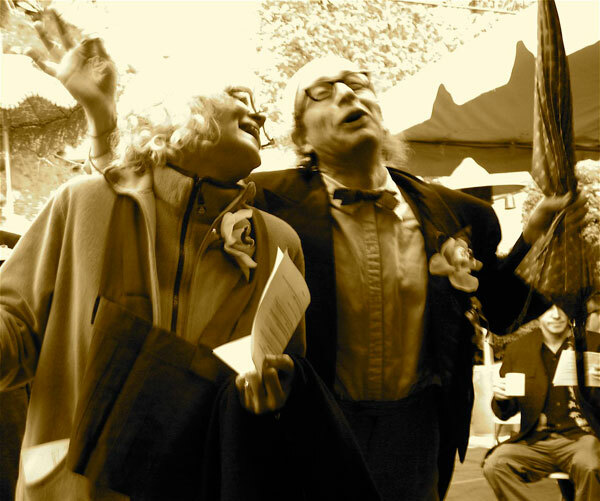 Moments of spontaneity in Clown performance hold such strong humor potential as the audience becomes doubly keyed in to see what will happen NOW.